Christmas and New Year have come and gone, while many JETs have done the opposite. 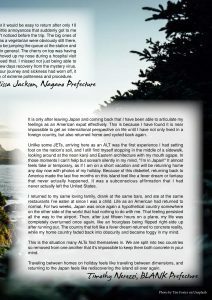 Here, five such people share their experience of returning to Japan after a well-deserved break back home, and what they thought of the culture the second (or higher) time around. Going home for a holiday is wonderful. You can fill your days with all the things you can’t find in Japan — pints of cider (alcoholic obviously), pubs, edible bread, actual cheese and the non-pixelated real-life versions of family and friends. Yet it is also disorientating. 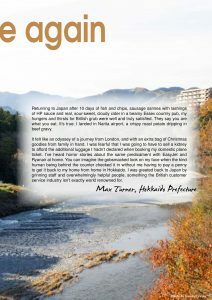 I found that my life in Japan seemed very far away, like I had just returned from a long holiday and now I was home for good. In some ways I found leaving a second time more difficult than the first. So, on that note, here are some words of wisdom from an (in)experienced JET. 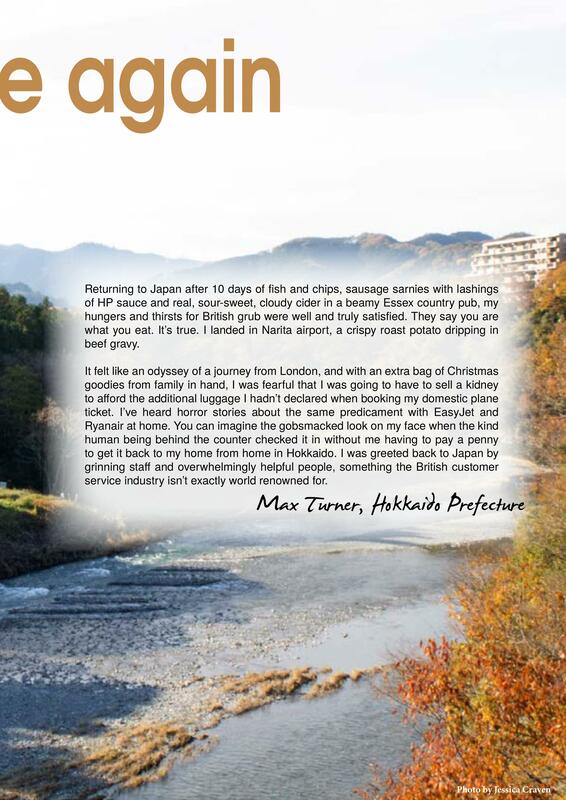 First, plan some things to look forward to in Japan on your return. 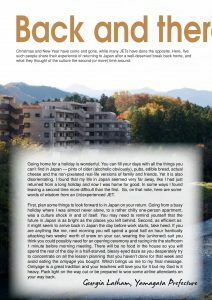 Going from a busy holiday where I was almost never alone, to a rather chilly one-person apartment, was a culture shock in and of itself. You may need to remind yourself that the future in Japan is as bright as the places you left behind. Second, as efficient as it might seem to arrive back in Japan the day before work starts, take heed. If you are anything like me, next morning you will spend a good half an hour frantically attacking two weeks’ worth of snow on your car, wearing the (unironed) suit you think you could possibly need for an opening ceremony and racing into the staffroom 1 minute before morning meeting. There will be no food in the house so you will spend the rest of the day in a half-starved, bleary-eyed daze as you desperately try to concentrate on all the lesson planning that you haven’t done for that week and avoid eating the omiyage you bought. Which brings us me to my final message. Omiyage is a great tradition and your teachers will love you for it but my God is it heavy. Pack light on the way out or be prepared to woo some airline attendants on your way back. Returning to Japan after 10 days of fish and chips, sausage sarnies with lashings of HP sauce and real, sour-sweet, cloudy cider in a beamy Essex country pub, my hungers and thirsts for British grub were well and truly satisfied. They say you are what you eat. It’s true. I landed in Narita airport, a crispy roast potato dripping in beef gravy. It felt like an odyssey of a journey from London, and with an extra bag of Christmas goodies from family in hand, I was fearful that I was going to have to sell a kidney to afford the additional luggage I hadn’t declared when booking my domestic plane ticket. I’ve heard horror stories about the same predicament with EasyJet and Ryanair at home. You can imagine the gobsmacked look on my face when the kind human being behind the counter checked it in without me having to pay a penny to get it back to my home from home in Hokkaido. I was greeted back to Japan by grinning staff and overwhelmingly helpful people, something the British customer service industry isn’t exactly world renowned for. After living in Japan for 5 months I thought it would be easy to return after only 10 days out of country. However there were little annoyances that suddenly got to me which either hadn’t bothered me or I hadn’t noticed before the trip. The big ones of not speaking the language and struggling as a vegetarian were obviously still there, but now hordes of elderly people seemed to be jumping the queue at the station and everyone was being particularly unhelpful in general. The cherry on top was having to pay for the pleasure of having a stick shoved up my nose during a hospital visit to determine if the flu symptoms were indeed that. I missed not just being able to make a whiny phone call to the boss for a few days recovery from the mystery virus. To be honest, once the effects of the 20 hour journey and sickness had worn off, it was a huge relief to be back in the country of extreme politeness and procedure. Japan is the latest in a long-ish line of ‘homes away from home’ I’ve had over the years, and it’s definitely the furthest — twelve hours in the sky from London to Tokyo, not to mention the airport journeys on either end. 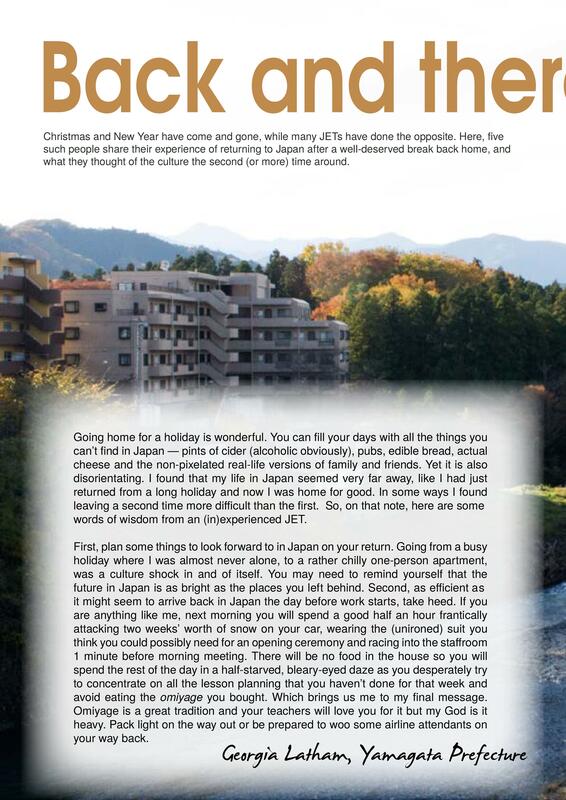 Whether you’re in your first year or your fifth, it’s probably always a surprise to realise how well you’re acclimatising to this beautiful, quirky and unique country — how you already know what you want at the convenience store before you even go in, or how easily you can rattle off an “arigatou gozaimasu” with a quick dip of your head as you leave with the chime echoing in your head. If you’re in the inaka like me, chances are the workers at your local convenience store will already know you and greet you like an old friend. Funnily enough, that’s something I had to consciously stop myself from doing at home — after being away for a year, there were things that made me feel like I’d never left, and other things that felt almost strange. There’s ups and downs — for example, I can’t get hot food or spare tights in my local corner shop back home, but I can get Walkers Prawn Cocktail crisps and flavoured instant coffee. As overwhelming as Japan can be on your first visit — I still remember vaguely panicking in my sleep-deprived state as the convenience store cashier in Keio Plaza asked if I wanted my bento heated up or not — when you’re returning from the holidays on JET, there’s often a certain sense of familiarity and accomplishment at feeling like you’ve adopted this topsy-turvy place where they serve red wine chilled as my second home. And when I’m still in that same sleep-deprived state, every time without fail on my return, I can’t help thinking that it’s good to be back. 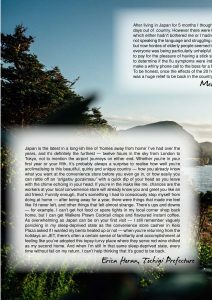 It is only after leaving Japan and coming back that I have been able to articulate my feelings as an American expat effectively. This is because I have found it is near impossible to get an international perspective on life until I have not only lived in a foreign country, but also returned home and cycled back again. Unlike some JETs, arriving here as an ALT was the first experience I had setting foot on the nation’s soil, and I still find myself stopping in the middle of a sidewalk, looking around at the neon kanji and Eastern architecture with my mouth agape. In those moments I can’t help but scream silently in my mind, “I’m in Japan!” It almost feels fake or temporary, as if I am on a short vacation and will be returning home any day now with photos of my holiday. Because of this disbelief, returning back to America made the last five months on this island feel like a fever dream or fantasy that never actually happened. It was a subconscious affirmation that I had never actually left the United States. I returned to my same loving family, drank at the same bars, and ate at the same restaurants I’ve eaten at since I was a child. Life as an American had returned to normal. For two weeks, Japan was once again a hypothetical country somewhere on the other side of the world that had nothing to do with me. That feeling persisted all the way to the airport. Then, after just fifteen hours on a plane, my life was completely overturned once again, like an hourglass being flipped right-side up after running out. The country that felt like a fever dream returned to concrete reality, while my home country faded back into obscurity and became foggy in my mind. This is the situation many ALTs find themselves in. We are split into two countries so removed from one another that it’s impossible to keep them both concrete in your mind. Traveling between homes on holiday feels like traveling between dimensions, and returning to the Japan feels like rediscovering the island all over again. ← Are You a Dancer?